The benefit of a software-based acquisition devices, like the new Blackmagic Design URSA digital film camera, is that is fully upgradable in the field and that protects a customer’s investment. 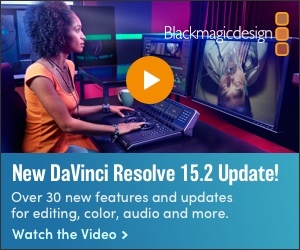 At this year’s NAB, Blackmagic highlighted two new models of the URSA “4K” camera with a new 4.6K sensor. The Blackmagic URSA 4.6K “EF” (Canon lenses) model will be available for $6,995 and the Blackmagic URSA 4.6K “PL” (for most other cameras) will be available for $7,495. Both are expected to ship later this summer. Pre-existing URSA customers can upgrade to the new 4.6K sensor for $1,995 for the EF lens mount and $2,495 for the PL lens mount via a firmware upgrade. All they have to do is purchase a “4.6K turret upgrade” and then replace the turret on the URSA camera (a simple board swap). Frame rates of 23.98, 24, 25, 29.97, 30, 50, 59.94 and 60 fps are all supported in the new sensor. The Blackmagic URSA, which can shoot in 4K, 3K, 2K and HD modes, features a 10.1” HD (1920 x 1200) viewfinder screen on the back for shot composition. Camera controls include touchscreen menus on two 5-inch LCD screens, push button controls for settings and navigating menus and integrated stereo microphone and built-in mono speaker. There’s a generous supply of inputs and outputs as well. A short tutorial on the camera can be found here. The prices announced at NAB are actually $1,00 cheaper than last year’s URSA model. The Blackmagic URSA, which can shoot in 4K, 3K, 2K and HD.